Scientists at Columbia University conducted a study which revealed that graphene retains most of its mechanical properties even when it has been stitched together from small fragments. This discovery may have been the first step toward large scale manufacture of carbon nanotubes, which could be essential in the manufacturing of the first space elevator, light – strong materials, and flexible electronics. 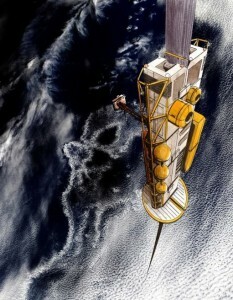 At the present moment, a practical breakthrough in the construction of a lunar elevator has not been realized. However, many scientists have performed experiments which show it will be possible through use of graphene. In these experiments, they have measured the strength of the microscopic carbon nanotube and proved it can indeed support the construction of such elevators. The space elevator ribbon is constructed out of carbon nanotubes, which are at least 100 times stronger than steel but have flexibility equal to that of plastic. Scientists will only be able to make the ribbon to be used in the space elevator if they manage to make fibers out of carbon nanotubes. In the recent experiments, the materials that were involved were neither strong nor flexible enough to form such a ribbon. Graphene ribbons have a very high tensile strength and very high elastic modulus, theoretically they are said to make the process of building a space elevator easy. There are two major ways that a lunar elevator ribbon can be built: in the first case a long carbon tube ideally several meters long will be braided into a rope like structure, and in the second case a shorter nanotube will be placed in a selected polymer matrix. So far graphene is the ideal material for construction of the ribbon, the carbon-carbon bond in graphene is at least 0.142 nm. Scientists have proved that two sheets of graphene are held together by much stronger van de Waals forces than bulk Graphene.